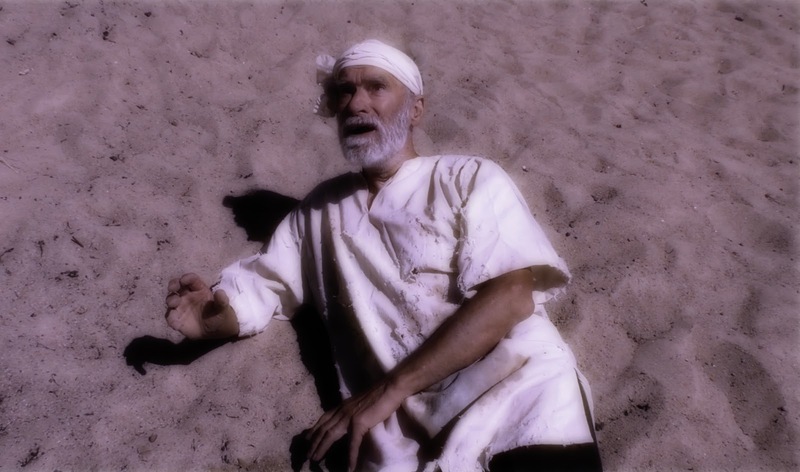 If you're familiar with the Tales of the Arabian Nights, then you probably know this story. This film was made for my day job at an educational organization, and it had a very short production history, about one week from conception to filming, which meant that I had to hurry up creating both the genie bottle prop as well as the genie itself. Let’s start with the bottle. It’s supposed to be a copper bottle, according to the Arabian Nights tale upon which this film is based. In fact, it is a squirt bottle for showering plants, and the worst thing about making this prop was probably removing the paper label on the bottle. It took quite some time, and a lot of scrubbing. 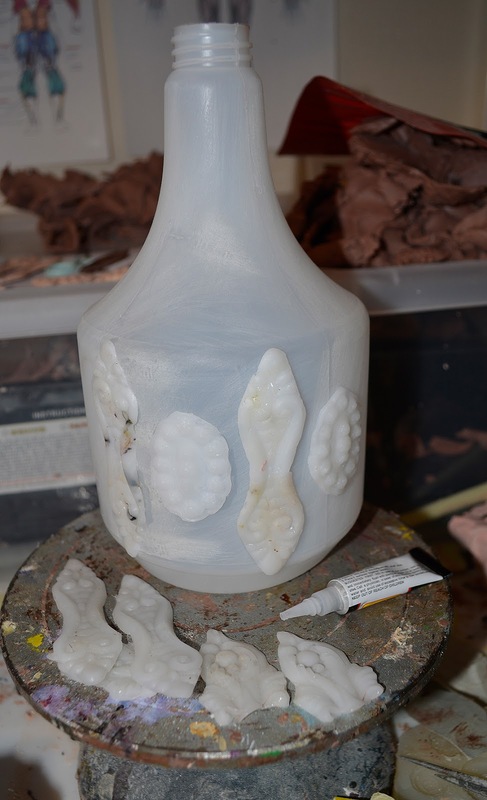 The bottle is decorated with various ornaments. 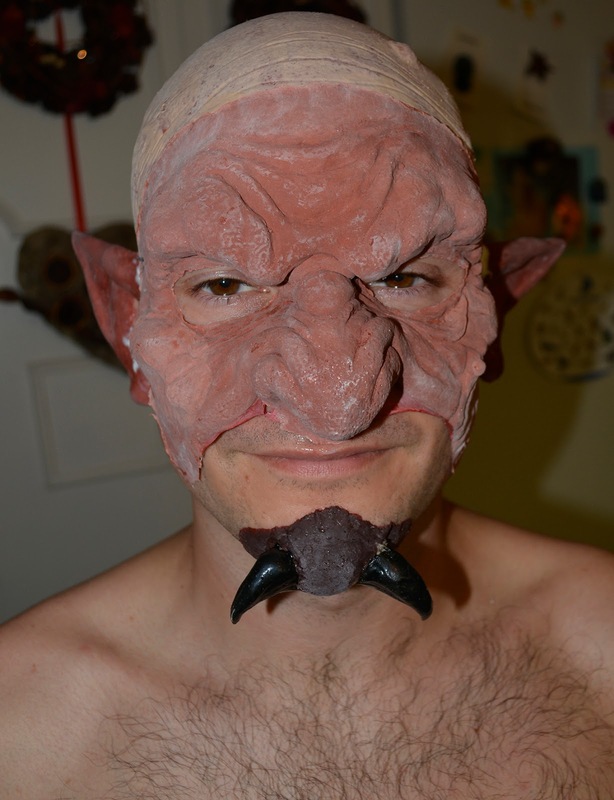 They all came from molds made from sturdy dental silicone clay. 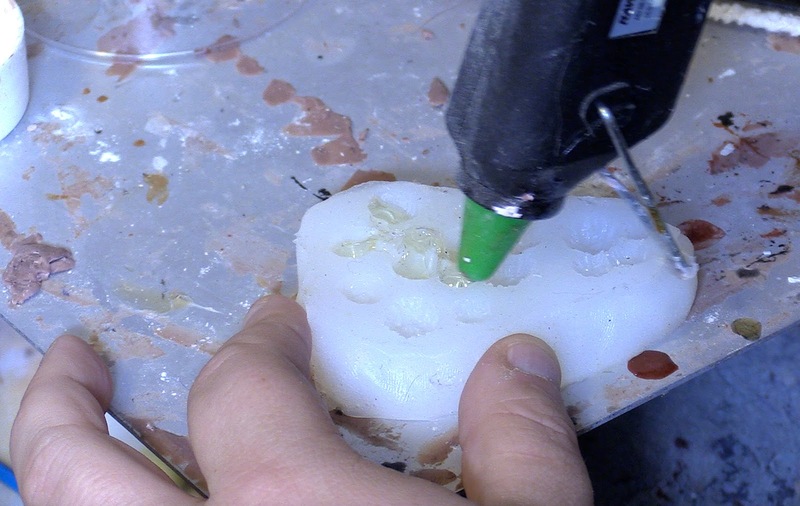 I’m using my Polymorph thermoplastic to make castings in these molds. 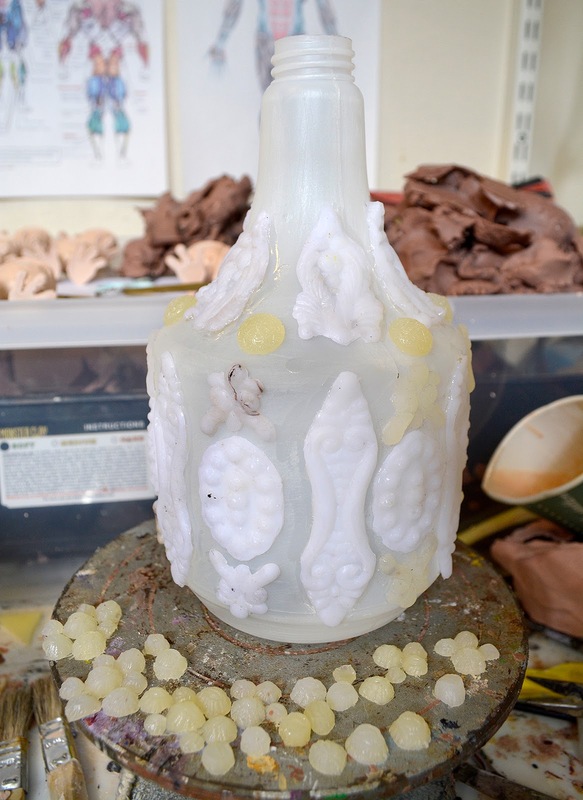 The plastic is melted using a heat gun, and then simply pressed into the molds. After a little while the plastic has cooled down and can be pried out of the mold. All of these bits are stuck on using very fast super glue. 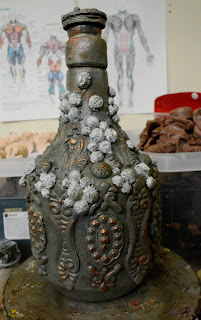 Since the bottle has been lying in the ocean for a few hundred years I thought it would be nice to add some barnacles to the bottle as a detail. Those barnacles were sculpted in clay and a DragonSkin silicone mold was made over them. Into this mold I added hot melt glue, which is probably the fastest, cheapest and at the same time sturdiest casting material out there. I just let the glue sit in the mold, which isn’t damaged by the hot glue. And when the glue had cooled I just popped the barnacles out. Of course, I had to trim off all the excess glue with a pair of scissors. 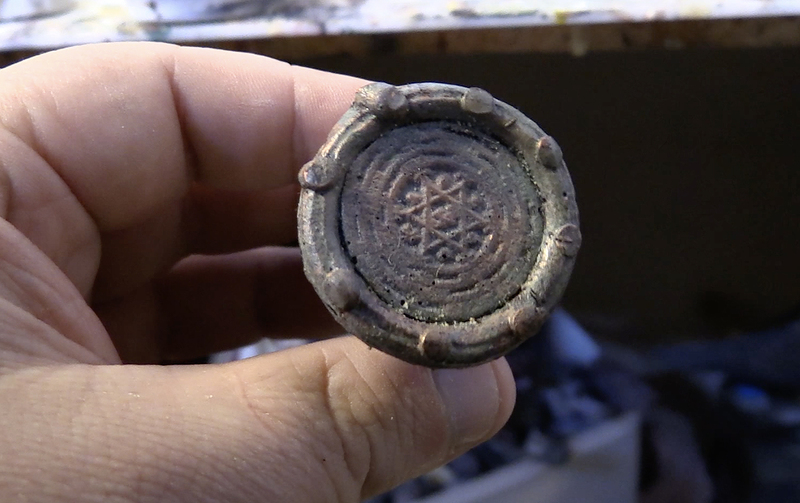 This is the cork for the bottle, adorned with the magical seal of Solomon, scourge of demons and genies. I made a mold from an old amulet I have, actually sporting this seal, and did another casting with the Polymorph plastic. It’s attached to the top of a container for those tubes of effervescent tablets you dissolve in water when you have a headache. This cork fits nicely into the squirt bottle top, but that top doesn’t look right at all, so I had to cover it up. 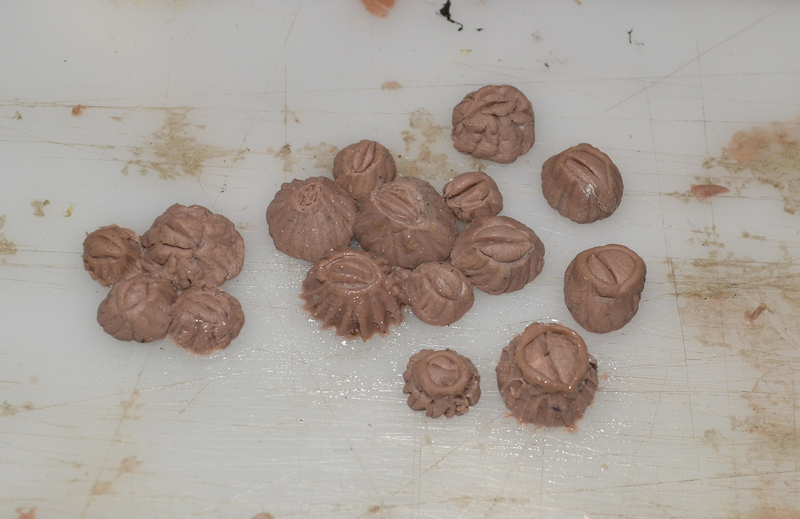 I didn’t have any epoxy at home, so I did a clay sculpt and then created a silicone mold over that. More Polymorph was used to cast the new bottle opening. The bottle was first given a coat of copper spray paint, then a layer of grayish green acrylic paints, and then another layer of copper, dry brushed on. And that’s about it for the bottle. On to the genie. The genie in the bottle was played my my old buddy Martin Merkel, who’s used to be made up as orcs and other creatures appearing in live action fantasy roleplaying. I didn’t have time to sculpt a new genie mask, so I actually used an orc face mask mold I made several years ago. 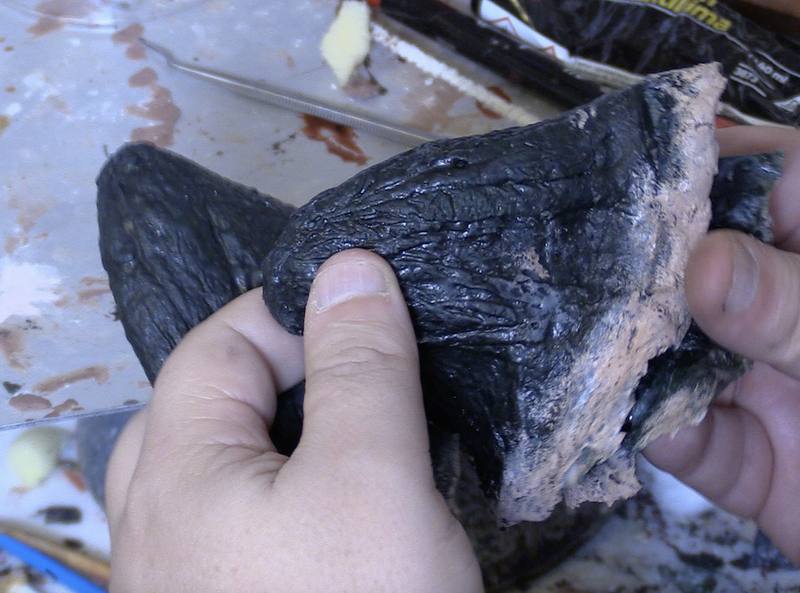 I added tinted latex to the mold using a bit of polyurethane foam. For areas requiring more delicate detailing I used a q-tip and a pipe cleaner. To speed up the curing of the latex I used a hair drying on its highest setting. 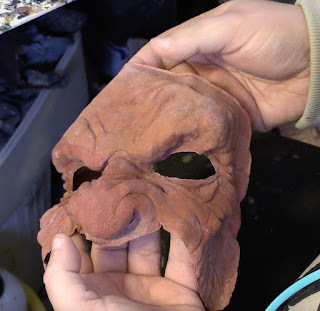 I added three layers of latex to this casting, not in every area, but on the deeper spots needing to be more sturdy, like the eyebrows and the cheekbones. The edges which will be glued down, are, of course, as thin as I dared make them. As you can see the skin color is a deep reddish brown. This will not be the skin color of Martin when I’m finished making him up, but this dark color will be a very good base upon which I will add the makeup. I also cast a pair of large pointy ears and a chin piece. 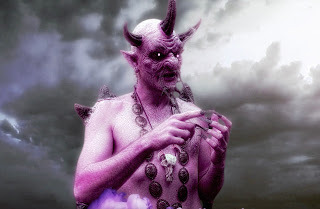 I wanted the genie to have horns, as they often do both in old picture books as well as in old Arabian manuscripts. The horns had to be very light, and, again, made very fast. 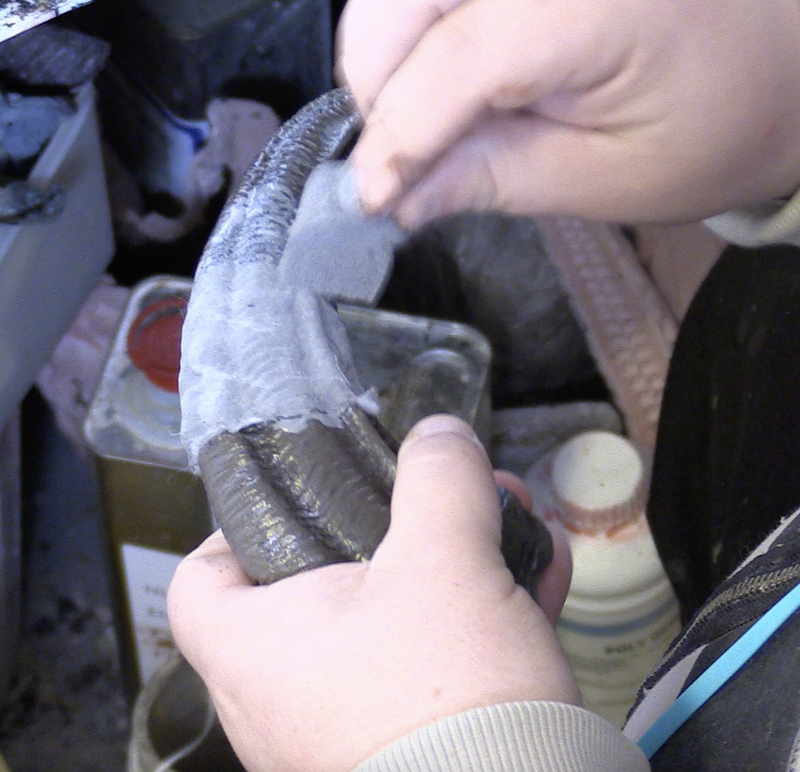 What you see in this image is actually a Velociraptor claw I made some years ago, cast in plastic. 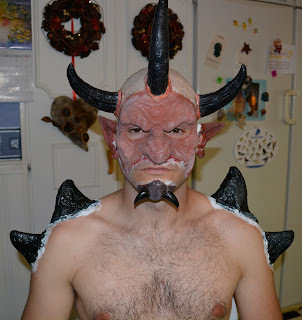 I simply built up the horns over this claw using tinted latex and cotton. 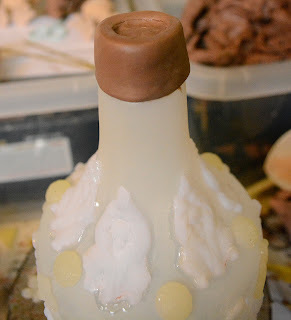 I added about two layers of this latex-cotton mixture, and let it dry properly. I then cut a slit along the inside of the curve of the horn and peeled off the latex skin like a banana peel. The latex skin was glued together again using latex, and the horn was stuffed with cotton. The fingernails were very simply made. I used an old plaster texture mold, adding tinted latex to it and then a few layers of tissue paper, laminated with more latex. When this concoction had dried I could peel it off the plaster mold and cut these kind of witchy fingernail shapes. They bend if you touch them, of course, but for these shots I wouldn’t have to worry about that. 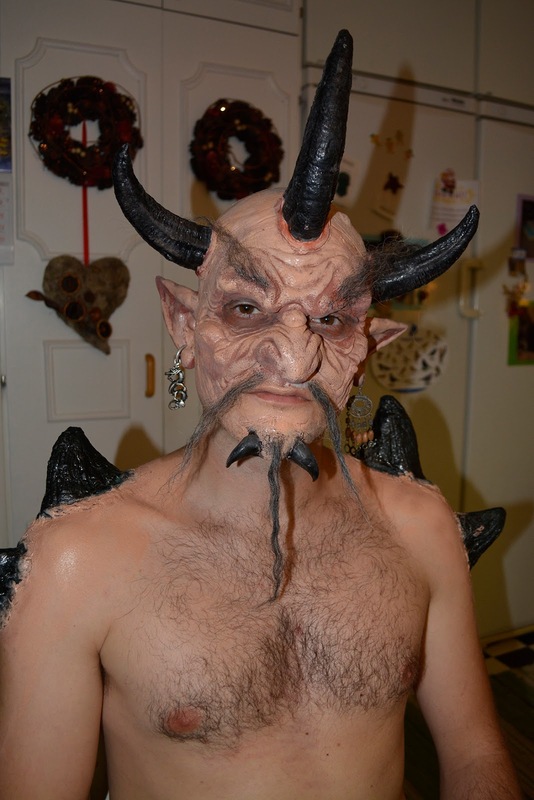 I also wanted to add some bony horn structures to the elbows and shoulders of the genie. 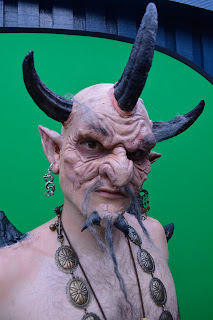 I used these, which were actually leftover horns for a big dragon’s head I helped build for a stage production. They were made the same way as the other horns, kind of. They were built up over clay shapes. Martin in my kitchen, ready to have genie bits stuck on. 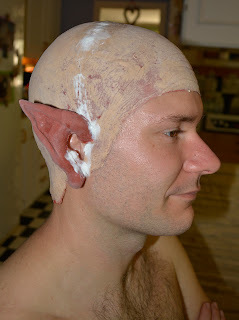 A latex bald cap, and the ears go on first. 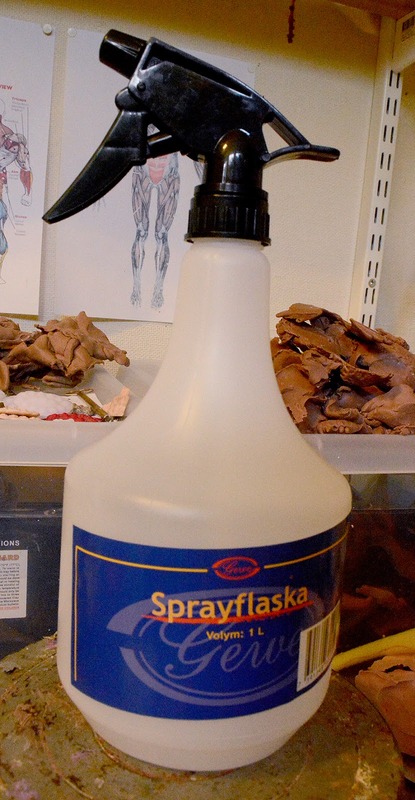 I use Prosaide cosmetic adhesive to glue down the rubber parts. The white stuff you can se smeared over the edges is Prosaide mixed with Cabosil powder. It creates a butter-like substance which is diluted and adjusted simply with saliva on a finger, and it covers the edge between latex appliance and skin. The face piece and the chin attached. The horns are glued to the skullcap using liquid latex. 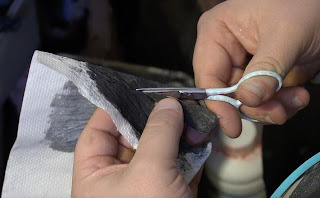 The other horn bits also go on, including the nails, which are glued on over Martin’s own nails using the Prosiade. Finally, the skin and the rubber bits are given a coat of rubber mask greasepaints, various hues and some rouge effects are added. The reddish brown base color now helps add some depth to the face. So there you go, a budget version of the mighty djinn, but in the end I think it turned out OK. Latex compared to foam latex or silicone is an inferior mask material, of course, but you can still go quite far with it. Think about all this classic Doctor Who makeups, mostly created by John Friedlander with liquid latex cast in plaster molds. I think some of them, like Davros, are still very effective. Filming the djinn was a very simply set up. We filmed outdoors in the soft evening light. I used a fold-out greenscreen stuck to my garage wall. Martin was standing against it, shot from the waist up. The natural color of Martin's skin was adjusted to a purplish red in After effects, and a digital plug-in tool called "Ugly Box" was used to make his skin appear mottled and wrinkly. What about the fisherman, then? 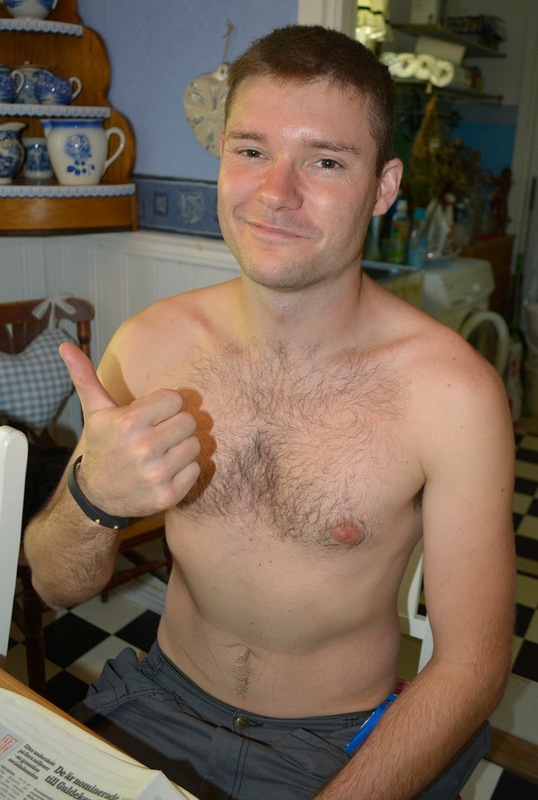 He was played by Staffan Bonnedal, an avid participant in local stage productions. 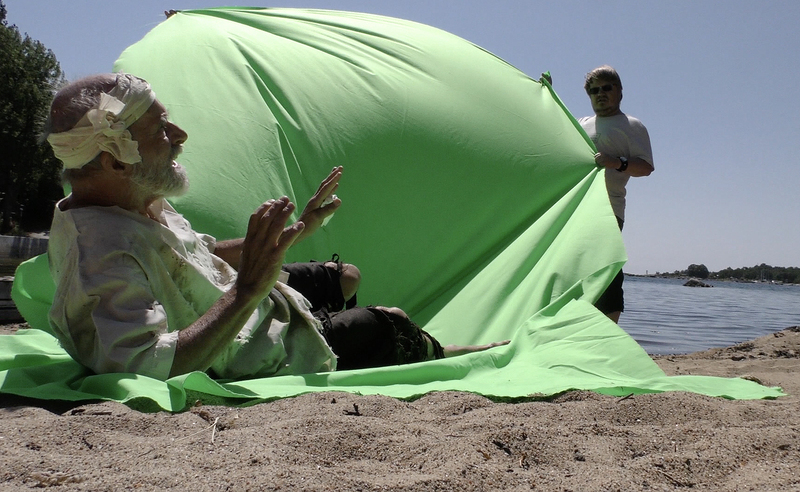 I've worked with Staffan in a few of them and figured he'd make a great older-looking poor fisherman, and he did. We shot all of his scenes on a small stretch of sand beach not far from my work. This particular day was quite warm (early June) and the beach was full of people, kids and dogs, although it was in the morning on a regular work day. 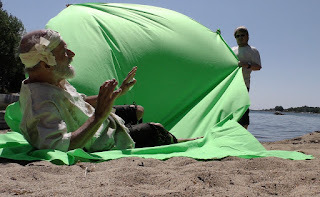 To get rid of the busy setting behind Staffan we employed a green screen, which was easier said than done, since it was also a very windy day. I held up the screen with a the aid of a temp trainee named Sandra, and my colleague at my day job, Ola Nilsson, shot all of Staffan's scenes. That's it for "The Fisherman and the Genie". 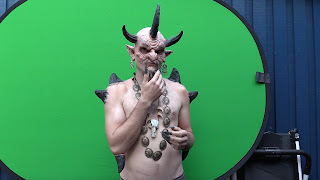 Though it was all pulled together quickly it was great fun to make, and my plan is to make more folklore- and mythologically-inspired videos the coming year. If time, funds and health allow that remains to be seen.